we love rewarding our regulars! VIBE card is a loyalty card that works like the current stamp card. But, instead of stamps, you will be rewarded with 1 point for each drink that you have purchased. You are entitled to a free drink once you have accumulated 10 points. PLUS, you are entitled to a free BOOST on your birthday. Wanna be a VIBE Club member? Just get a Boost and a shiny silver VIBE card will be presented to you! SO YOU’ve decided you wanna BE A VERY IMPORTANT BOOST ENTHUSIAST? Once you have your shiny silver card in your hand, you need to register it! Otherwise we don’t know who you are and how to reward you for being a great Boost customer. Simply click the link here to ACTIVATE YOUR CARD. Then buy and enjoy Boost! The best thing is that you are now a part of the Boost family and we love our members! For more details on VIBE club, check out the FAQ’s to get the answer to your VIBE question! You can also check your points by logging into your account using your e-mail and password! This is how it works . . . every drink you buy earns you 1 point – once you get to 10 points, you receive a FREE drink! 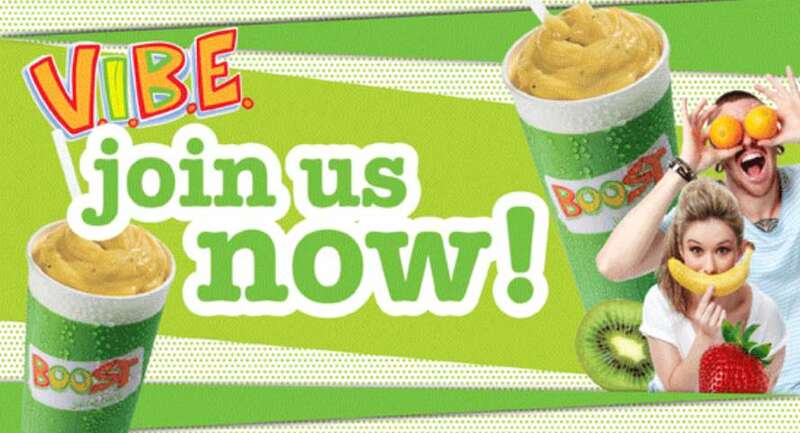 And because we love celebrating, you also get to grab a FREE Boost on your birthday! Love Life! So if you’re not already, why not become a Very Important Boost Enthusiast today! Read for the details!